This long Zara sweater with "Just Parfait" on the front is from last year collection. I love to wear it with skinny jeans. I added a detachable bib peter pan collar necklace to the sweater. The tartan jacket is used as a cardigan to add a touch of color and of british rock to this look. I was wearing my parka jacket but didn't take pictures with it. Layers are too important with cold weather !. Questo lungo maglione con la scritta "Just Parfait" sul davanti è della scorsa collezione di Zara. Lo trovo perfetto da indossare con jeans skinny. Ho indossato un colletto in pietre staccabile sul maglione. La giacchina in tartan in questo caso è stata da me usata come cardigan, per dare colore e aggiungere un tocco di british rock al tutto. Ovviamente, indossavo anche altro, il mio parka, anche se abbiamo scattato le foto solo senza. Gli strati di abiti sono la sola salvezza con il freddo !. 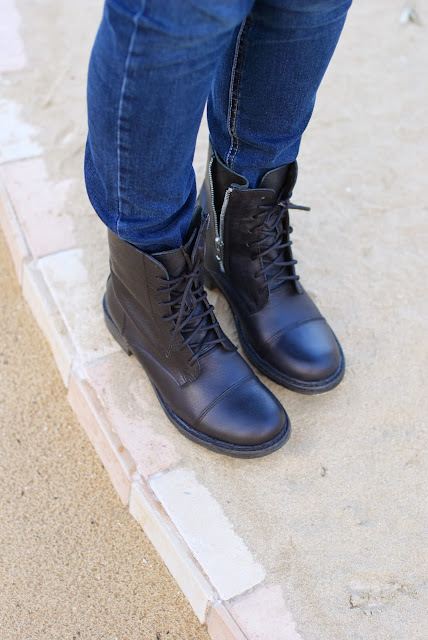 Let me introduce you to my new combat boots ! I got them for a very cheap price and I am so fond of them ! I've been wanting to get a pair for so long, also because I can't find my old Dr Martens anymore...and these ones are great also because have a zipper on the side, it means they are wider on the leg, and the zipper plays an important role because it can make them wider to welcome my skinny pants without my legs looking awkward !. Vi presento i miei nuovi anfibi ! E' stato un vero affare e li adoro ! Ne volevo un paio da tempo, anche perché non sono più riuscita a ritrovare i miei vecchi Dr Martnes...e questi sono fantastici anche perché hanno una chiusura zip di lato che permette di calibrarne la grandezza sulla gamba...lasciandola semi aperta come ho fatto riesco ad infilarci dentro gli skinny ottenendo un effetto migliore !. My versatile too hot to handle Marc by Marc Jacobs flap-top bag in peacock color was the bag of choice for this everyday outfit. The hat was necessary for the weather, it's been very humid lately, and this is a perfect excuse to wear fedoras, at least. Speaking about hats, do not forget there is an amazing giveaway going on here, you can win a wonderful hat 100% Made in Ecuador ! Click here to enter !. 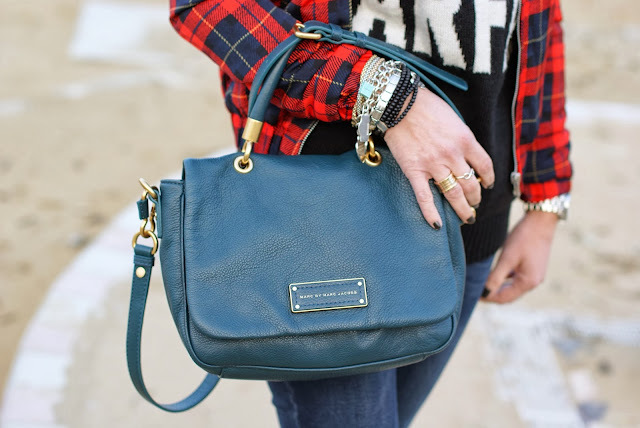 La mia borsa super versatile Marc by Marc Jacobs "Too hot to handle" color pavone è stata la prescelta per questo outfit adatto a tutti i giorni. 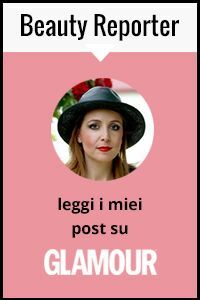 Il capello si è reso necessario per via del tempo, ultimamente molto umido, ottima scusa per indossare fedora, se non altro. Parlando di cappelli, non dimenticate che c'è ancora tempo per partecipare al fantastico giveaway Ecua-Andino e vincere un fantastico cappello 100% Made in Ecuador ! Cliccate quì !. 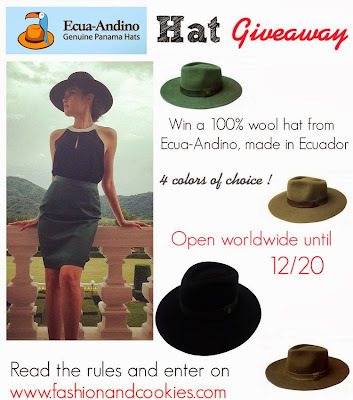 Thanks to this new worlwide giveaway, a lucky winner can win a wonderful wool Ecua-Andino hat, and pick a color of choice...for a present or just for yourself, this is a super nice gift !. The giveaway is open until December 20th, to read the rules and to enter click here ! so gorgeous! love this look. Those boots are classic and so versatile! I like your plaid jacket and sunglasses. You look great as usual. La giacca mi piace molto Vale!!! Bel look cara! You look great! I plan to go and see the Hobbit this weekend. I love the plaid jacket! You look amazing! Love your jacket. And I'll go to the Hobbit this weekend as well! It premiers tomorrow here and YES I cannot wait to go and see it, so excited!! That sweater is so fantastic. I love the pattern! Nice outfit! Love your style! You look genius! Wonderful! Ci piacciono gli stivali da battaglia ... Ancor di più se economici! Comunque outfit carinissimo! Stai davvero bene! Beh tu con just parfait io oggi con pardon moi, abbiamo proprio qualcosa da dire con el nostre maglie!! Bello il giacchino scozzese di persun mall!! I haven't seen the movie, but I guess it's nice. The sweater is a killer. Especially with skinny jeans. Quanto mi piace questa giacca tartan! Anche a me piace tantissimo andare al cinema, ci andrò pure io a vedere Lo Hobbit! ;) bellissima la giacchina Vale e adoro il cappello! Sai che la giacca tartan mi sembrava una camicia? Mi piace! The detachable bib with the Just Parfait sweater is just beautiful! love the coat and boots! where are they from? great look!! I love your casual looks so much. Also,your outfit from below is stunning! Wow, I love your hat and the booties! La borsa di Marc Jacobs è semplicemente stupenda. Mi piace praticamente tutto, dal colore al modello allo stile.